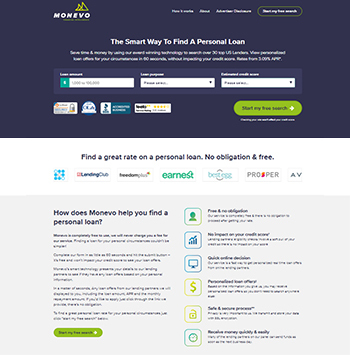 Monevo is an accredited and multi-award winning online personal loan comparison marketplace. Consumers with fair to excellent credit scores can be matched with loan offers from over 30 top US lenders and banks in less than 60 seconds. Since 2008, Monevo Inc. has offered personal loans through their online loan marketplace in the UK. Starting in 2017, Monevo expanded their award winning loan comparison services to borrowers in the United States. To apply for a personal loan through Monevo, you can simply visit their site and fill out a free application, which can take as little as 60 seconds. This step by step form allows you to choose the loan amount, term, and the purpose of your loan from a drop-down list. It will also ask for some details regarding your annual income, employment, credit scores, education, personal information, residence, and Social Security number. Monevo's award winning technology then forwards this information to their lending partners (who may or may not require this data for a loan) to see if they have any real-time loan offers that match your needs. These lenders will run a soft credit check to see your credit score and verify your identity. This process only takes a matter of seconds and does not affect your credit score. Are you in need of a personal loan? Instead of directly providing a loan, Monevo provides an online network that connects borrowers with top lenders. In general, the better your credit score is, the lower your interest rate will be. After you receive your loan offers, you can compare them through a clear, organized table that transparently shows you the interest rates, repayment term length, monthly repayment amount, and other loan details. There is no obligation to follow through with these offers, but if you choose to, you simply have to click the link provided. The loan is finalized on the loan provider's website and your funds are provided via direct deposit as soon as the next business day. Keep in mind that a preliminary loan offer from Monevo's network does not guarantee that is exactly what you will get when you follow through, since the loan details may change even after you get your initial offer. Because Monevo does not directly provide loans, the loan terms, costs, disbursements, interest rates, fees, and penalties are decided by Monevo's partner lenders. Any questions you have should be directed to your lender. 100% free and no obligation loan matching service: Monevo is a completely free service, and there is no credit score impact when you submit an application (only a soft pull of credit is involved). Industry accreditations: Monevo has multiple trusted accreditations, including the OLA (Online Lenders Alliance) seal and an A- from the BBB (the A- is only due to the short time they have been in the US market). Receive your funds quickly: You can receive your money as soon as the next business day. Simple application process: Monevo's application can be completed in as little as 60 seconds, and is made simple with their clear step by step form. You can compare your offers through a transparent loan comparison table. This table shows your potential interest rates, loan amounts, loan terms, and more. Secure website: Monevo uses the highest level of SSL encryption to protect your sensitive, personal data. Realtime chat support: Monevo provides quality customer support to their users through realtime online chat functionality. Positively reviewed service: As of April 5th, 2019, Monevo has a customer experience rating of 3.8/5 over 381 user reviews from the online comparison site Feefo. Monevo is a relatively new service to the US market (compared to their competitors in the marketplace like LendingTree or LoansUnder36). However, their UK lending marketplace services (established through the international fintech company Quint Group) are well respected and have been established since 2009. There is no phone number to contact Monevo directly. Interested consumers must fill out a form online or contact Monevo through live chat. Borrowers must have a minimum FICO® credit score of 580 to qualify. Loan amounts range from $1,000 up to $100,000. Repayment terms range from 3 months to 96 months. APRs range between 3.99% to 35.99%. Your specific loan details like pricing, amount, terms, and interest rates depend on your individual lender. How does Monevo compare to other lenders? Monevo's services can connect you to a multitude of lenders who offer varying interest rates and loan amounts that go as high as $100,000. How do I know if I qualify for Monevo? Individuals who are eligible to qualify for a loan through Monevo's partners must be a US citizen or permanent resident and be at least 18 years of age. You can submit a simple application with basic personal and financial information to find out if you are approved. How can I contact Monevo? You can contact Monevo through their contact form online at www.monevo.us/contact.